Everywhere in Hoi An you will see lanterns. 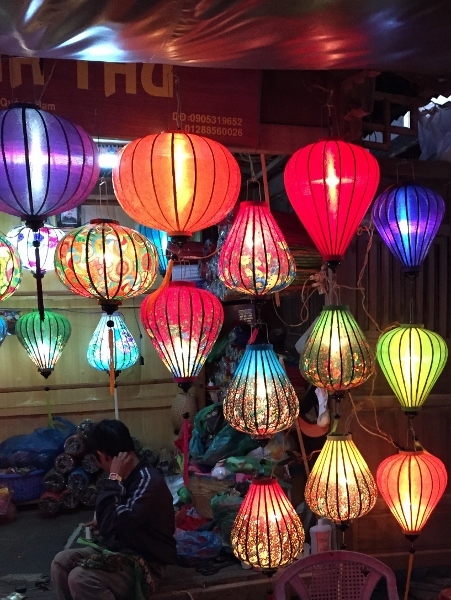 They hang from trees, line storefronts, stretch across bridges and simply light the night – lanterns of Hoi An are truly a specialty of this Vietnamese town. Made from silk and brocade skillfully stretched and attached to bamboo frames, they are truly beautiful and create an almost fairy tale like scene day and night. 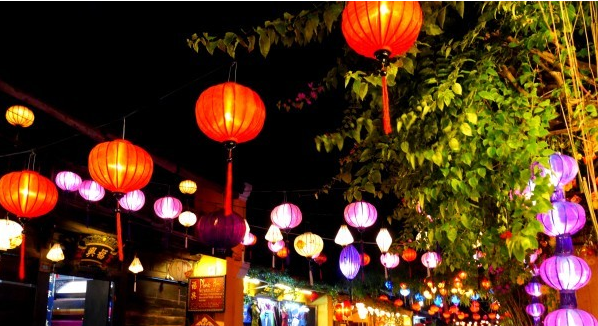 On the 14th day of each lunar month (full moon), Hoi An hosts a lantern festival. For the Vietnamese, the full moon is a time to honor ancestors and they set up small shrines of stacked fruit, incense, and fake money in order to gain good luck and prosperity. It is said the town truly transforms… and it is something I think I would like to come back to see. Lanterns are actually not very expensive and the cost, of course, depends upon the size and whether or not you get one which hand painted. The lanterns come in every size, shape, color, and fabric you could possibly imagine. Be sure to haggle a little bit when you buy. Prices run anywhere from 60,000 Dong to 100,000 Dong for the plain ones. One that is handpainted may run you as much as 100,000 Dong more (to figure the cost in US Dollars, basically drop four zeros and divide by 2). You can see that they really are a bargain. One piece of advice I read was to make sure they show you how to reassemble or open it when you get home. 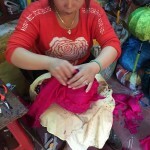 7 Comments on "The Lanterns of Hoi An"
Great travel artical and love those lantern pictures. Once again again, your travels inspire me to go places that were not on my “Life list”! Wonderful pictures & really appreciate the history/story or the lovely lights! I think we will have to add a joint trip to SE Asia to our list! I bet it was majestic in the evening when the lanterns were all lit. Great post!